The 2017 KPMG Women's PGA Championship golf major for women golfers on the LPGA Tour is taking place this week from June 29 to July 2, 2017, at the Olympia Fields Country Club located in the Chicago suburb of Olympia Fields, Illinois. Here is a list of the top LPGA women golfers in the playing field for the 2017 KPMG Women's PGA Championship. Since this is one of the five golf majors on the LPGA Tour and offers a big prize money purse of $3.5 million every eligible woman golfer is playing this week. That includes all the following. Past winners of this golf major not mentioned above in the 2017 playing field are Yani Tseng (2008, 2011), Cristie Kerr (2010), Suzanne Pettersen (2007), Se Ri Pak (1998, 2002, 2006), Karrie Webb (2001), Juli Inkster (1999, 2000) and Laura Davies (1994, 1996). 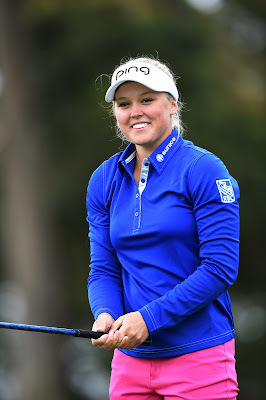 Popular and well known women golfers in the playing field not already mentioned above include Paula Creamer, Sandra Gal, Charlie Hull, Jessica Korda, Brittany Lincicome, Mo Martin, Caroline Masson, Belen Mozo, Azahara Munoz, Gerina Piller, Morgan Pressel, Beatriz Recari, Michelle Wie and Cheyenne Woods the niece of Tiger Woods. Good luck to all the women LPGA golfers this week at the 2017 KPMG Women's PGA Championship!